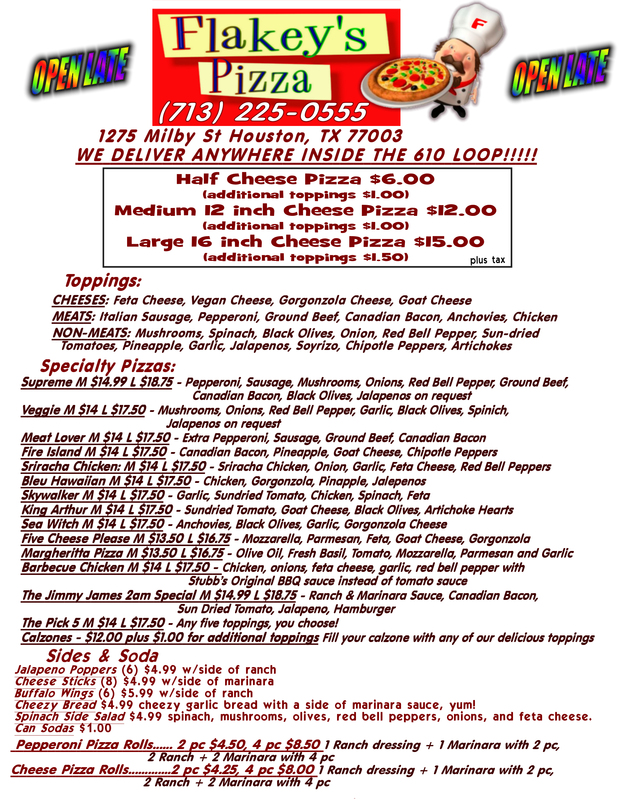 (713) 225-0555 WE DELIVER ANYWHERE INSIDE THE 610 LOOP!!!!! OPEN 6pm to 3am 7 days a week! Daiya vegan cheese option available! We pile it high! LOTS OF WONDERFUL MEAT! Set the night on fire with smoky island goodness! It is cheap and yet exotic! This is a tribute to the defunct Late Night Pie’s famous Skanky Whore pizza. Great pizza for a wild knight out on the town! Elvis would have dug this one (that is just a guess)! Traditional Italian style pizza with olive oil, fresh basil, fresh tomato, chopped garlic, mozzarella, and parmesan cheese! Please note, this style of pizza does not have marinara sauce. A gooey mess of mozzarella, parmesan, feta, gorgonzola, and goat cheese! Defeat late night munchies with the Jimmy James 2AM Special! Ranch and marinara sauce, Canadian bacon, Sun dried tomato, hamburger, and jalapeno is all you need! Chicken, onions, feta cheese, garlic, red bell pepper with Stubb’s Original BBQ sauce instead of tomato sauce. mmmmmmmmmm specialty pizzas hit the spot! Cheezy Bread $3.99 cheezy garlic bread with a side of marinara sauce, yum! Spinach Side Salad $3.99 spinach, mushrooms, olives, red bell peppers, onions, and feta cheese. or use the internets and ORDER ONLINE!